No estimate just yet. Prototypes are pretty much settled, just have to gather the funds for production. Production is almost complete, box design should be done today. Working on finalizing everything. Slight twist in the overall planning. We were so impressed with the end result, we might be merging two model lines and moving to very competitive pricing. I will say more when closer and all details finalized, but simply my goal was to improve on the Gcon. Well, that is not quite what happened. As I believe it was @altoncustomtech who figured out early on that the previous Gcon was a different take on the original Icon. It was essentially a 90% Gen 1 Icon, just with a different name, keeping in mind our last Icon was about a 150% Gen 1 Icon. That being said, the Gcon was one of our all time best selling subs as it sat right in the sweet spot of performance and price and that people really just loved it, it was a perfect pairing to the Icon at the time and had a great run. a very straight forward design that landed just right. Sadly, we didn't make profit off of the Gcon. It was a break even effort at best. Many who have not run a business don't realize how much is taken out of a mark up on a product when it comes to shipping, taxes, fees, materials, overhead, customer service, marketing, monthly expenses just to keep the websites running, in addition to all the fees taken from each order for transactions etc. etc. No one really knew, but all this time the Gcon (and Dcon for that matter) were kind of a labor of love. We held on to both models here in the USA as long as we could. 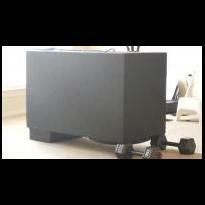 We were very lucky to have that level of subwoofer still made in the USA. But sadly, it was a poor money move to keep the Dcon and Gcon made in the USA. The market is in a massive race to zero and too many people who have no real background in audio, or experience in it, or have any respect for it, and are seeing it as a quick money opportunity. I just deleted a long rant, but the race to zero is responsible for the downturn in the USA production, which effectively put an end to the Dcon, Gcon, and... well.... Each one of these models you become attached to as they have been apart of your life for a long time and they start to feel like players on my soccer teams I coach. It's very tough to lose one. Again, I have rambled on too much. Back on point, the goal was to build upon the much loved Gcon and make it be a smart business move for once. As I said above, that is not quite what happened. The pile of missed on prototypes at my place is getting nuts, and no, not selling them. Anyway, on paper and by ear, prototyping started out ok. Wasn't super happy with the low end extension and it was missing that warmth and smoothness across the range that has always been a signature to our subs (including the little brute F8L). But wow, did that one peak so much harder than planned, if I was ever to go back and do a modestly priced numbers sub that can play daily, I have one in the kitty. Moving on, a few parts changed, motor design changed, coil adjustments etc. Didn't like the specs. Got some outside help from an ole friend in VA who has had a long history with us and built a lot of our stuff, and things changed again. Motor really gained some size, surround larger, different cooling, longer coil. I am sure you can gather by now what had happened. All the while my goal was to remake and release a Gcon replacement. This had surpassed that somewhere in the middle of the process as I think I got a little carried away. As we have been running with this alphanumeric system of naming (outside of the Evil of course), and I felt it had gone well past the "G" slot in the line up. So "H" names started getting tossed around, my favorite was Hades (greek mythology, god of the underworld, from the depths below, riches from the soil, also called Pluto (my pups name)), this thing is a stout 3" coil sub, 12-spoke etc. all traits shared with Gcon and Icon for example, so you can see how fitting the Hades name is, we also considered putting it in the F8L line, but it just doesn't fit and is not related to the F8L at all. It was some work to launch a new model name in the F8L, luckily the name was just right and people have loved it right from the get go. (More are on the way before anyone asks). While all of this was happening, we held out hope for another missing model to return made here in the USA. After a long lay off of production of subwoofers when at one time, we only had the F8L available (very scary to think about looking back), the Xcon, Zcon, Evil were all overhauled and a new halo sub was introduced, the Team Evil. I am sure, based on the sheer amount of questions I continue to get, that many have noticed the Icon didn't return with its bigger brothers. During this time, there was a little effort to try to redesign the Icon to build upon the existing model while still being an Icon and still making it worth the time for both us and our build house. When I was just out at CES, I spent some time at our build house and tried to hash out a feasible option to make the Icon work here in the USA. No luck. With the capabilities of the build house and the money we don't have, it was looking not so good. With my internal designation of "Gcon replacement" (ala Porsche 996, and knowing it couldn't be called Gcon due to so many changes), we decided to award this with the SSA Icon name! Our longest running model name, 11 years now. I could not let the Icon go away, it is a fixture of SSA and has been the heart of the line up since day 1. What we have in production now is a very stout, heavy abuse tested, smooth response, warm low end sub that takes rated power with great ease. I prefers slightly smaller boxes than that of the older versions, in addition it is a pinch more numbers friendly. We are keeping the rating at 1250w rms. If you want an easy way to get to know this new model, think of it as a slightly smaller version of the NEW Xcon, more so than a tuned up older Icon. As for my comment above about merging two model lines, well, that might be confusing. The internal designation of Dcon replacement had a similar road. But, I think it will possibly be the merging of what was the Dcon and Gcon slots, but we will see. I will get more into that later, as the prototyping stage is done, now it is onto get the funding. I do apologize for not releasing more info sooner, but so much was influx and impossible to give concrete news until now and I have so many projects in the works at once. Due to funding limitations, the Icon is returning in a 12" size first, then followed by 10's and 15's depending on demand and funding. Hopefully that all makes sense and is good news. I don’t think you could have explained it any better. It’s pretty easy to see where everything is going and what you’re trying to accomplish. I would definitely buy a 15" Icon Aaron for my current enclosure. Remember I always wanted to try one in a diy home audio setup as well. Thanks for opening up to us, means a lot to me as a customer and forum member. I had an Icon 15: what an amazing sub ! The Xcon was more "powerful", but still smooth. I tried a Zcon, but It was not my thing : maybe it was too strong ! I will never hesitate to tell a friend to get an SSA sub. Keep doing your thing, SSA. Its a slow process as this transition is a hard one and takes a great deal of up front capital to achieve, hence the speed and number of models being changed over at once. The 15's will be coming down the pipe as funding allows. I try to do some news updates for SSA on our occasional Instagram live that we do from time to time. That is great to hear. The Zcon is a very specific kind of sub, but it is cool to see the amount people using them in musical installs. Yes, they are on the way right now to us.